Let's review a quick summary of the "recovery" in U.S. labor markets as America takes a much needed day off work. We'll begin by looking for winners within the labor market to try and determine who should be celebrating this holiday. The following chart shows the change in real median income from 2009 to 2014 across race and ethnicity. If we cannot find growth looking at race, where else can we look? Ah yes, class. The next chart shows the change in pay across each income level, and we have found it. 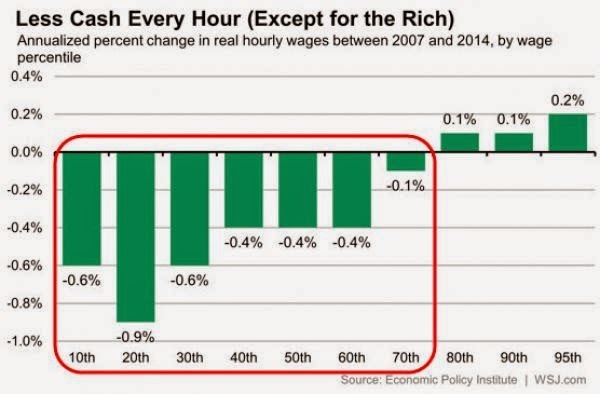 The top 20% of wage earners experienced income gains during this period while the bottom 80% have declined. A report this week showed that within the upper middle class of the United States (income from $75,000 to $99,999), 55 percent have absolutely zero in savings. Most can be considered as having a negative net worth due to massive debt loads that continue to grow. 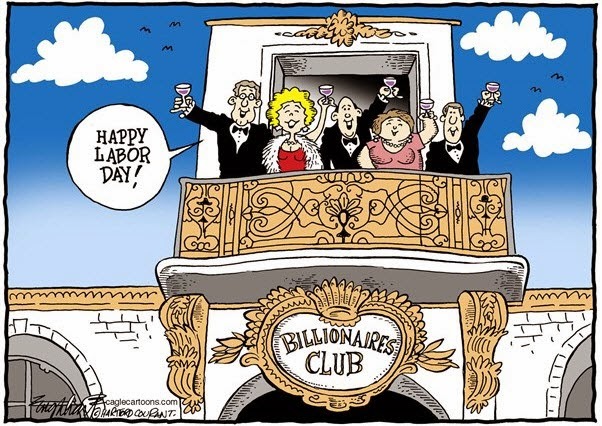 So as we celebrate this labor day a select few within our borders can continue to cheer the divide that grows within America; the haves become far more wealthy while the middle class slowly erodes into the enormous pool of the poor. Those that study history know that the Roman Empire did not fall due to some great outside military force. It crumbled due to the rot that grew within the foundation of its own economy. The divide between the rich and the rest grew so large that the empire destroyed itself from within.